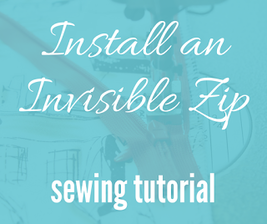 Who hates sewing in an invisible zip? I have to admit I still sometimes do. After years of sewing I have my days when I just don't want to fiddle with a zip. But I've devised a way where you can sew in an invisible zip with the least amount of frustration. This tutorial has been put together with my new pattern - MiSS FOX DRESS. It has a CB invisible zip. I love sewing the back neck facing for an invisible zip. It's so easy and so straight forward AND it looks professional! That's because this is the way it's done in the industry.